Working alongside a winning team of vendors including Magnolia Vine Events and Eric & Jamie Photo , P.E.W.S helped create an intimate setting at a loft wedding in Birmingham, AL. The wedding was a classic affair, complete with stunning florals and elegant design. The Bridge Street Gallery & Loft was the perfect setting for such a romantic ceremony. Our white Mobile Pews looked perfect nestled beside warm candlelight and simple greenery. We love how our pews create an intimate atmosphere through their timeless appearance. Friends and family get to sit side-by-side as they watch you tie the knot. A Church setting can even be created in a simple loft setting through antique church pews. "All of our Guests were Raving about the PEWS"
Finding church pews for our wedding ceremony site was the first thing on my wedding planning agenda. I wanted to combine our love for the church & the outdoors. We knew right away we wanted an outdoor wedding, so this was the perfect way to create that 'southern outdoor church wedding' ambience, which was perfectly done so by the help of PEWS. With the exciting craziness of the day, the first time I was able to see the pews was when I was about to walk down the aisle, and they were simply gorgeous! It was exactly as I had envisioned it, and the best part was - I didn't have to do anything! 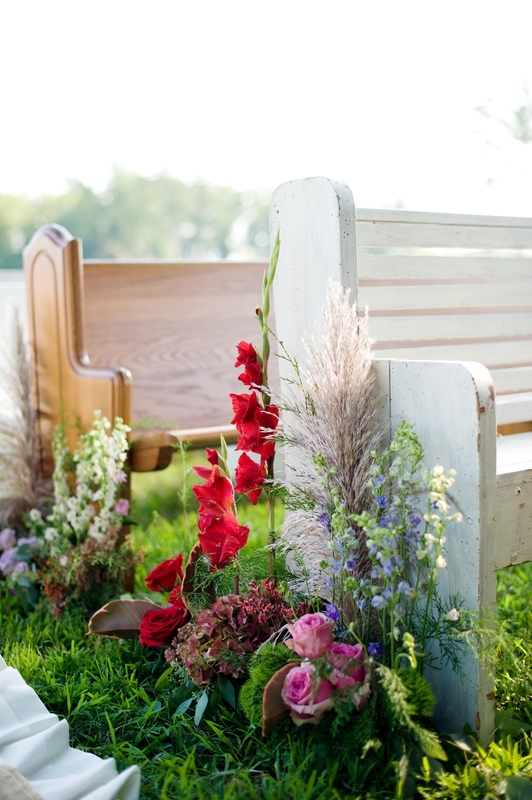 WHAT WOULD YOU SAY TO BRIDES ABOUT HAVING OUR CHURCH PEWS AS A PART OF THEIR CEREMONY? I would highly recommend using Pews for your wedding, they are wonderful, easy to work with and have so many beautiful pews to choose from! WHAT WAS YOUR FAVORITE COMPLIMENT ABOUT THE PEWS? All of our guests were raving about the pews and thought they were the 'perfect touch' to our special day.